01-06-12 Ragnar Florida Keys, 199 mile, 6-person ultra relay 27:01:30 – 8th place division, 31st place overall. 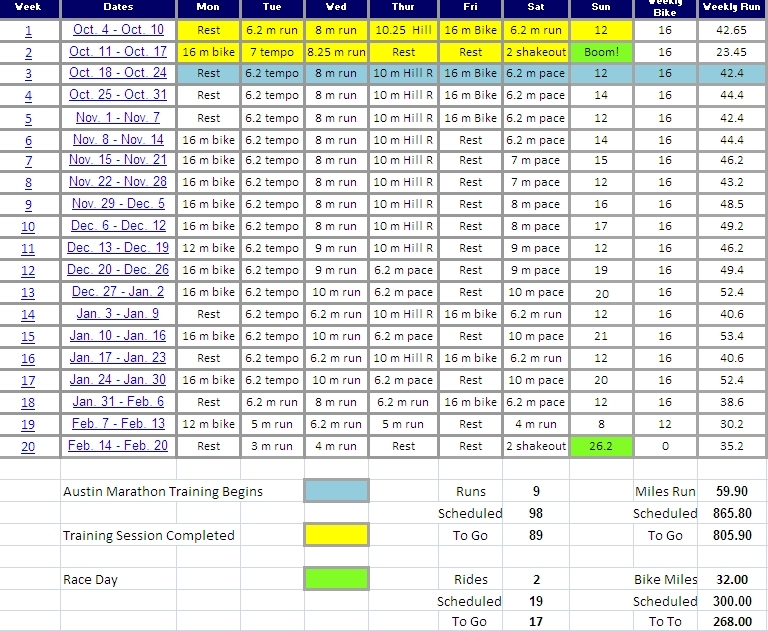 01-28-12 The Texas Half – 1:25:35 – 1st place division, 11th place overall. 02-19-12 Livestrong Austin Half Marathon – 1:24:07 – 3rd place division, 69th place overall. 03-17-12 Anthem Shamrock Half Marathon – 1:23:46 PR – 6th place division, 68th place overall. 04-16-12 Boston Marathon – 3:44:41 – 862nd place division, 5,386 overall. 05-06-12 Rookie Triathlon – 57:11 – 1st place age group, 5th place Division. 06-16-12 Holland 5K – 18:56 – 1st place age group, 6th place Overall. 06-17-12 Lake Pflugerville Triathlon – 1:12:42 PR – 6th place age group, 51st Overall. 07-15-12 Couples Triathlon – 1:16:35 – Team Finished 19th Overall. 09-30-12 – Kerrville Half Iron Triathlon – 5:06:57 PR – 3rd place age group, 18th place Overall. 11-22-12 – Thundercloud Subs Turkey Trot – 30:50 PR – 2nd place age group, 65th place Overall. 12-7-12 – Lights of Love 5K – 18:02 PR – 1st place Masters, 4th place Overall.